Home » Blog » The Web and Your Business » Why WordPress? If you’re looking to create or update a website and you’ve done any research at all you’ve probably come across WordPress. You may have also come across an almost dizzying array of other options - like the other "W's": Wix and Weebly, or the slick looking Squarespace, or "website builders" from Godaddy and other hosting companies. With so many options, how can you know which system to choose and why you should choose it? Seriously…forget about anything else that starts with W, or any of those web host-provided drag & drop builders, or that “website builder” software on your computer. They might be OK to get you started, but eventually you’re going to need something that they can’t provide. You'll find yourself at that frustrating point where you want to move to the next level and you can’t because you’ve chosen a system with limits that just can’t give you what you need, how you need it. So what exactly is the big deal? Why are millions of websites run on WordPress self-hosted? Why do I see it as the best choice for most small business websites projects? Early websites were just a series of pages, individually created and then linked together. Then along came the CMS – Content Management System - a database driven platform that allowed websites to be created in a much simpler way. Nowadays, growing your web presence with a CMS is much easier than ever before. No more being stuck in the past, with a site that needs new information added or has some glaring usability issue that you can't easily fix. Start with a CMS and give yourself room to grow and evolve. The WordPress CMS allows you control over your content. You can sort it, display it and update it as often as you want. It’s an integrated system that is easily organized and searchable. You can add functions with relative ease. The power of a CMS absolutely eclipses any old-fashioned plain HTML website, it’s as simple as that. Responsive web design is a big buzz-phrase these days. It may seem complicated but using WordPress makes it easy. Not all WordPress themes are responsive, so you still have to choose a theme well. However, there are many responsive themes to choose from and making the right theme choice makes all the difference. 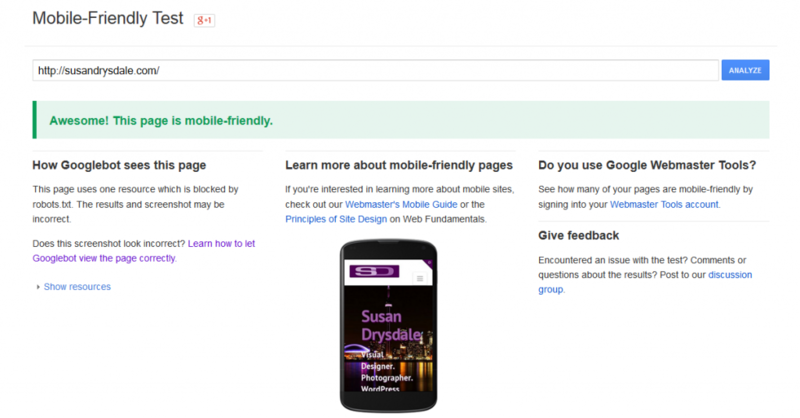 As of April 2015, Google search rankings will take into consideration the mobile-friendliness of a website. That means your old HTML, non-responsive website is about to tank in the rankings. Responsive is also a must, given the wide range of web-enabled devices we all use now. Trying to use a non-mobile-friendly website on your phone is extremely frustrating and your users won't stick around long if you're no making it easy for them. What about a separate mobile site? That’s an acceptable solution, but, frankly, I find it redundant and unnecessary. Why have two versions of the site when one is all you need? The mobile option is a workaround provided by some companies in lieu of a fully responsive site. Forget the workarounds. Go with a solution that has responsive behaviour from the start instead. Need to add a new page to your site to feature a new product or service? Have a new staff member who needs to be added to the website? Whatever the situation, many who have had websites for their business in the past have arrived at the “uh-oh, we need to update the website” place and had to go back to the web designer to make even minor changes - which costs time and money. With WordPress you can login and add/remove content with ease. You still may wish to outsource that work, but can still be done much faster than in plain HTML. There are also options to add a portfolio, or testimonials, or staff loops that quickly add simple ways to archive content. Using WordPress allows you more control, flexibility to respond to changes in your business information. If you’re as impatient as I am, after about 5 seconds of not finding what you came for on a website you are hunting for the search field to look up what you need to see. If I don’t find a search field? I’m outta there. Did you really think you users were going to hunt around every page of your site hoping to find what they came for? They won’t. So providing search functionality is an absolute must. It’s standard to all WordPress installations. Use it and help keep users on your site, instead of chasing them away. Of course, you have to have the content there when they ask for it - so try searching your own site to see where there may be gaps and how you can add more relevant content to keep them interested. Your website needs to be more than just an online brochure. It’s a communication tool that users want you to have. Whether though simple contact forms or comments on your blog you can provide ways to start conversations about your content that can lead to business. You can create different contact forms to target different users, add social sharing functionality so others can share your content on their network and use social media itself for direct communication. Communication is not just outward anymore - publishing content and expecting people to call you is somewhat limiting. Users want to communicate with you, but at their leisure, online, rather than just on the telephone or in person. Many visitors actually prefer to use web forms or social media to get in touch. A WordPress website provides lots of options for starting and continuing conversations these conversations. You can also integrate social media links, sharing options and feeds to grow your presence in those areas as well. 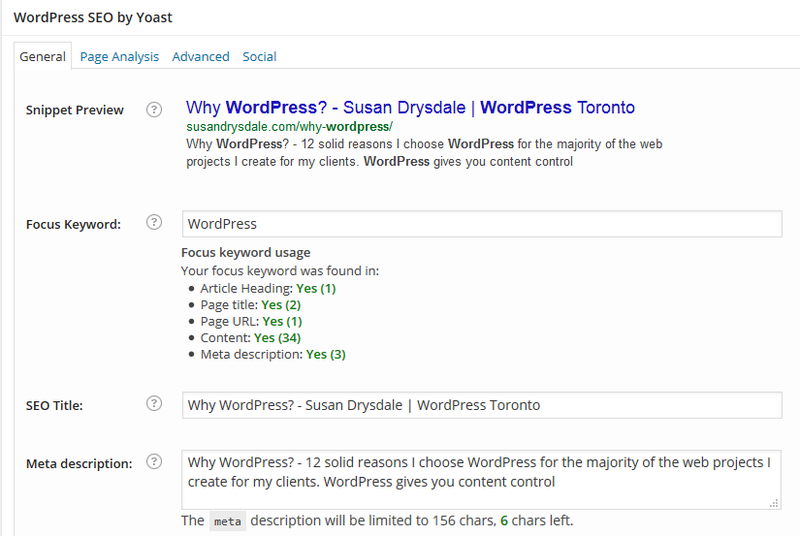 WordPress is the foundation for good SEO, no doubt about that. 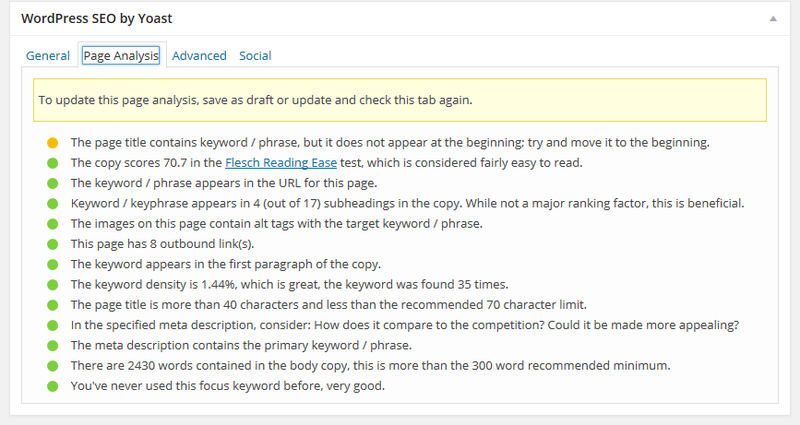 On its own, WordPress is quite SEO friendly. Then add a plugin, like Yoast SEO, and understanding how to maximize the SEO value of your content becomes much clearer. SEO has become much simpler in the past couple of years – and there is good and bad to that. The good is that you don’t have to employ any tricks to get rankings. Stuffing pages with keywords or other black-hat SEO techniques is actually going to do more harm than good now. Don’t let those SEO spammers trick you into believing their grift. The bad, unfortunately, is that you have to do actual work to get what you need out of SEO. That means creating good, relevant content - which is much harder to do that just push a bunch of keywords into the copy, or put a bunch of links on your page. The upside of that for users, is that when we arrive at a website via Google it actually matches up with our needs better than before. SEO is still a big topic, and understanding how to get the most out of it requires time and patience. WordPress provides an excellent starting place to develop your SEO. Content is King. It’s also the thing that plagues most web projects. I am absolute stunned by how many people still want to focus first on the look of a site and practically ignore content. Every project gets bogged down at the content stage. While, WordPress can’t create your content for you, it can help free you from content woes, at least a little. You can get the most important things online first, to reduce delays in launching your website. Tell them who you are, what you do, how they can contact you. Then add all those big ideas you have for your new web presence, one by one, over time. If it’s not all ready to go at the start, then create it and unveil it as you can - hopefully soon and often. WordPress makes it much easier to evolve, iterate and stay current with your content. Instead of pages left blank that say "Coming Soon", just save pages as drafts so you can preview, review and edit before publishing it and adding it to your menu. There are a wide range of options for content presentation within WordPress as well. Both text and media can be handled in a wide range of ways, and you can try a few different ones until you find what works and what users like. Making adjustments here and there as you gather more intelligence is easy – and a very good idea. Using tools like Google Analytics can really help you see what's going on with your users and their reaction to your content. You can really get a sense for what exactly is going on with your web traffic, and adjust your content and behaviour as needed. What are they commenting on? Who is contacting you through your web forms? You can't really know if all the things you've envisioned for your site are working or not until it's live and getting traffic for a few weeks, or ever months. With WordPress you have the flexibility to respond to what you've learned - do more of what's working, dump what's not or try new, different tactics. “No coding necessary”. It’s something you see everywhere these days, not just with WordPress. Even those other web builder systems will try to sell you on this. Not everyone is cut out to deal with code. It’s bit too much “math + science” for many to find comforting. Of course, “no coding necessary” is also kind of misleading. Of course there is code necessary, no site runs without it. What they really mean is that with a GUI (Graphical User Interface) you can write, add photos, style the layout and publish content using built-in editors. If you need to dig into the code, you can, but if that's not your thing, you don't need to see it. The back-end of your WordPress website – the WordPress core, themes and plugins - are ready to use without having to know the back-end code (PHP– the hard stuff). The people who write these things are constantly updating and improving their code to address any bugs and keep up to latest standards. This is where the real “no coding necessary” part really comes in. With WordPress you don’t need a separate development team to create the back-end of your website. I’ve already mentioned the powerful Yoast SEO plugin and how it can help you get found on Google. That’s just one of a wide range of plugins that provided. This again, is where the coding experts manage the hard part. Plugins can cover things like third party integrations (MailChimp, Facebook, etc. ), Security, Backups, and a host of other functions. It's a bit of a balancing act between knowing the functions of a theme and where to use plugins to get what you want. Of course, you can’t just go plugin crazy and add dozens of plugins of every last feature you can think of. Plugins have to be used with caution and only quality, recognized plugins should be used. Plugins also need to be kept up to date, so respect and be responsible with plugins to keep plugin issues under control. This infographic from BlueHost that recently caught my eye outlines the evolution of WordPress from its beginning in 2003 through 2014. As you can see, it’s constantly being developed and improved. I first started using WordPress around version 2.3. It has come a long way since then. No doubt it will continue to evolve more and more as new technologies emerge. The large and ever-growing WordPress community provides an almost endless source of information and guidance. Some people find the learning curve a bit steep, but if you are patient you'll be amazed at what you can do. There are blogs and videos all about how to work with WordPress and good themes have support contact and forums to help you with issues. And then, there are pros like me who have developed a depth of knowledge and broad experience on how to navigate all this WordPress stuff. You can always hire someone to help you if you're just not interested in managing the site yourself. This is a big one. If you’ve been in business for long you’ve probably had to update your website a few times already. That may have been a frustrating experience. While you will, and should continue to update your website every few months or so, doing so can be much easier once you are working within the WordPress environment. Once you’re setup properly in WordPress you can change, update, grow and evolve as needed. I have dramatically changed my own website several times, completely changing the look and feel of the site, yet remaining in the same WordPress installation and keeping the content intact. A new theme, some new styling, a bit of content rearranging and voila, “new” website – or at least it looks new on the outside. After over a decade of providing the world with an incredibly powerful platform for free WordPress has become the obvious choice for many businesses to make an impact online. I've been using it to help small businesses and projects connect to the world for a few years now and I'm a huge fan. In fact, I've made it easy for people to get started with WordPress or update their current WordPress website by creating WordPress Packages with small business owners and artist in mind. It's easier than you may think to move to a WordPress self-hosted solution.